A mysterious hole appeared in the cabin of a Southwest Airlines passenger trip mid-flight. The cabin immediately lost pressure resulting in a “controlled descent” from 36,000 feet to a safe landing. Witnesses claim everything from calm action to pandemonium. The FBI says it was “mechanical failure” and not an acto of terrorism. I’m really looking forward to an explanation as to why a sudden hole would appear in an aircraft in flight. Stay tuned. 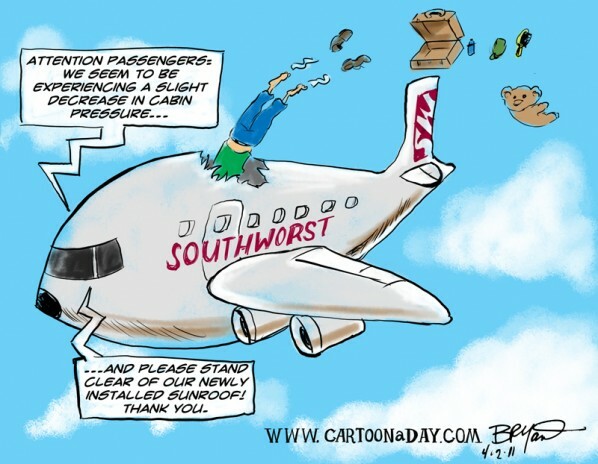 Inspiration: A funny cartoon of a Southwest (Southworst) Airline in flight. The Flight experienced a sudden hole in the fuselage.